Very similar to the Stage 3 exercises, the first part of this was to select images from work done so far and play around with producing some textural studies from them. 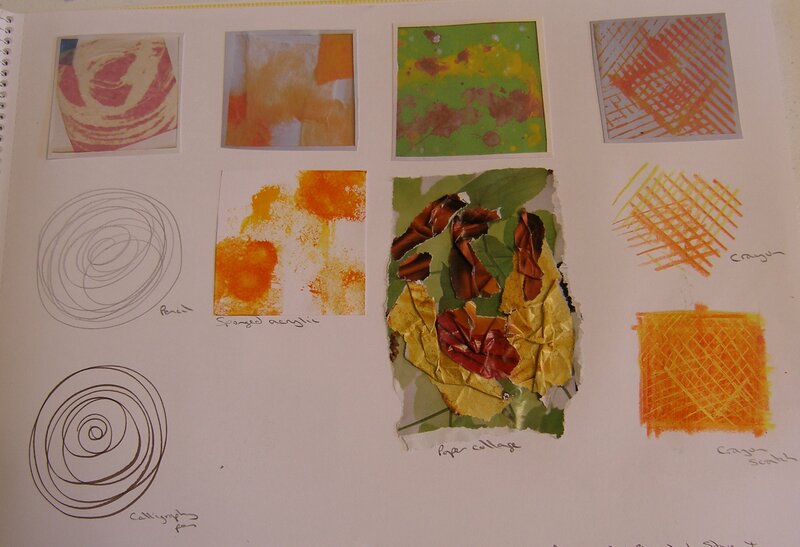 This page shows four extracts from the different exercises and textural studies from them. 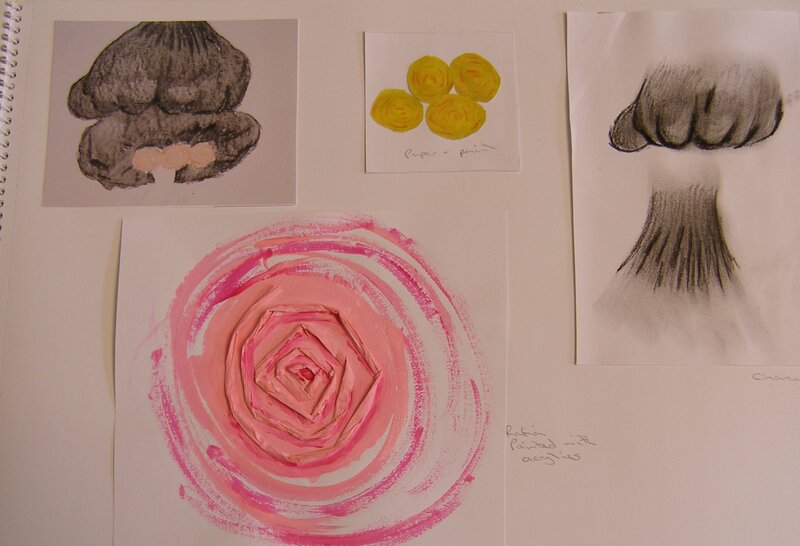 From left to right the swirly design is very rose like and I did drawings in pencil and with calligraphy pen. This could also have been done with gluing string down to form a raised spiral or by making a printing block from string, painting this and stamping with the paint. 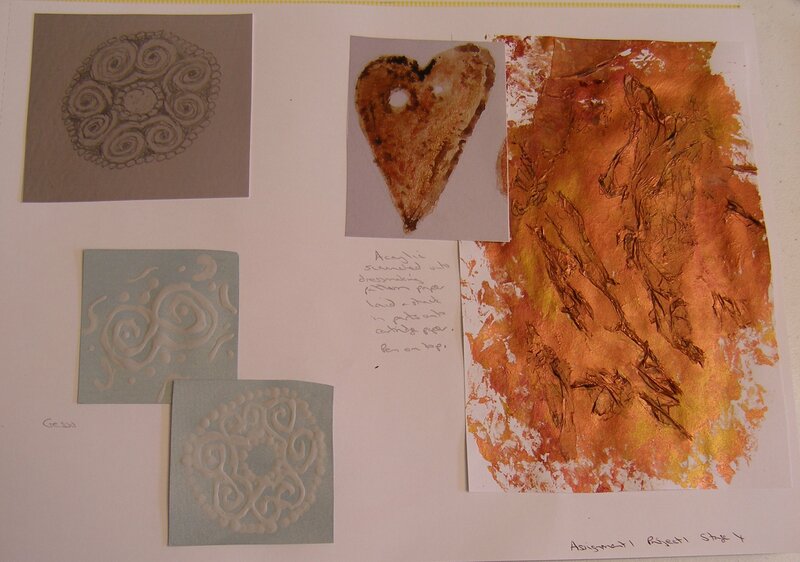 The apricot coloured design second left I created with sponged acrylic paint. I like the sponged effect as you can get a good paint coverage or alternatively apply the sponge to scrap to remove a lot of the paint before applying it to the final paper to produce a lighter image. The paint splashed image second right I did a paper collage version of. I am growing to like collage as a working medium because of the range of textures and colours that can be almost instantly produced. The right image was originally produced by combing. I used wax crayons for the textural studies, firstly just drawing the straight lines and secondly using the crayon scratch method. The combination of the two crayon techniques worked well as they produced positive and negative versions of the original and these could be used together in one textile piece. This next page shows two images from my sketchbook. On the left is a button drawn in pencil and then enlarged. I used gesso to produce two textural images based on this, one repeated the full design and the other just a section of it with some other similar shapes around. The other image is of a copper button that I painted in acrylics. The production of the textural study for this was a happy accident. I applied three colours of metallic acrylic paint to dressmaking pattern paper and scrunched this in my hands to spread the paint and produce an uneven surface. As there was quite a lot of paint on the paper and placed it face down onto some cartridge paper to take a print of the colours for use in another project. When I removed the tissue pattern paper some of it had stuck into place. I instantly liked the effect so deliberately tore into the pattern paper and applied more of it to the surface of the cartridge paper, smoothing some areas flat and scrunching others up to produce the mottled surface of the copper button. Once dry I used pen to add some shading on top of the paint to give shadow to the raised areas. I am particularly pleased with the result here – the combination of colours, the variation in surface texture and the extra detail added with the pen. The image top left below is a section from my sketchbook of a Valentino cocktail dress, done in watercolour pencils. To the right are yellow roses cut from a magazine, with pencil applied on top to bring out the shadows. Right of that are two drawings in charcoal trying to achieve some light and shadow effects in the material. The large pink swirl is glued raffia which was then painted with acrylic paint in two shades. The pink colour is not my favourite but I do like the effect of the raised raffia contrasting with the flat surface of the paper, and also where the two colours of paint swirl around the outside of the raffia in a very rough and free manner.